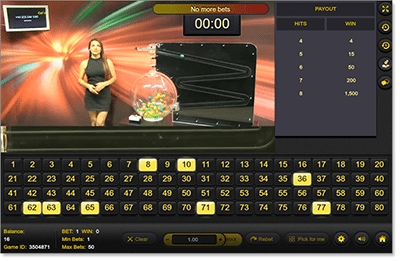 The comprehensive payout structure of Keno is what differentiates the game from Bingo. Fixed pay scales, also known as paytables, are used for each Keno game, varying significantly from game to game, and venue to venue. The Keno payout structure allows you to pick as few or as many numbers as you would like for a round, and still have the chance for high returns (if you’re lucky). 1/ How many numbers are chosen by the player. 2/ How many numbers are ‘caught’. 3/ The player’s total wager for the game. As with any gambling game, you want to play Keno on a platform where you’re given the best payout rate possible. We’ve gathered together the best payout structures from the best online Keno games available at reputable online casinos. We’ve also researched brick and mortar casino, TAB and other land-based venue Keno payouts, so you can see exactly where you’ll get the most bang for your buck. In All Slots Casino’s Keno game you can select up to 15 numbers, and how many numbers you choose will alter the payout structure. For instance if you only select one number, and that number is chosen you will be paid out three times your betting amount. However if you were to select five numbers you would only get a payout rate of 0.5 if you were to get a hit on only one number, but you could potentially get a payout of rate of 50 if all five of your numbers come up in the Keno draw. The game is flash-based so you can play it instantly without having to download any additional gaming software. The interface is easy to navigate and the game runs smoothly. The only Keno game Guts Casino has is a progressive jackpot game called Bonds Keno Jackpot. In this Keno variant you won’t receive a payout for only receiving one hit, but the game has a very rewarding payout system if you’re lucky enough to pull multiple hits in a round. The maximum amount of numbers you can select for a round is 10. The graphics, audio and animations in the game are of the highest quality, which makes for exciting and immersive play. Krazy Keno: This game has bright colours and has lively sounds and animations. When you start your round you watch the balls being drawn one by one, much like an old school live lottery. The round starts as soon as you click play. You can select 10 numbers from the range of 1-40. Instant Keno: This game is in a similar style to Krazy Keno but there’s more numbers to choose from. You can select 10 numbers from the range of 1-80. More balls are drawn from the 80, helping your chances of getting a hit. Klub Keno: This game is themed like an old country fair, the colours and sounds have a comical cartoon feel to them. You can select 10 numbers out of 40 and can keep your numbers for 10 games. Live Dealer Keno: G’Day Casino also has live dealer games available in blackjack, roulette, baccarat, lottery and Keno. This is where you have a real croupier drawing your numbers in real time, all of which you can watch via a video stream. Live dealer games are so interactive now you can even interact with your dealer. As a rule online casinos offer better payout rates and odds than land-based casinos, simply because their running costs are lower and they can afford to. Keno isn’t an exception, in general payout rates will be better when you’re playing Keno online compared to playing it live at an offline casino. If you’re interested in the average payout rate offered at a casino, most will display that information somewhere on their site. Any reputable Web casino will be tested for security and fairness by an independent third-party, examining them for the quality of their random number generators and the fairness of their payout rates. You should be able to see the payout rate for each game too. 4 hits: 1 in 4.877 (20.5 per cent). 5 hits: 1 in 4.287 (23.3 per cent). 6 hits: 1 in 5.258 (19 per cent). 7 hits: 1 in 8.826 (11.3 per cent).